The Perquelin valley is a narrow valley that runs south-east from St. Pierre de Chartreuse for about three kilometres to the hamlet of Perquelin. Drive to the top of the road, and at its conclusion, continue along the forest track for 100 metres, where you will find a car park (grid ref. UTM 31T 72314 50237). From the car park follow the forest track past a clearing, until you cross the Guiers Mort stream. A few metres on you will pass the path coming down from the Grotte du Guiers Mort, on which we will be returning. We continue ploughing up the track, ignoring the first two tracks that goes off towards the right. About half an hour after leaving the car, a proper path takes off to the right with yellow way-markings, and a yellow cross advises that the main track is not the way. Turn right, and immediately cross a small stream. This path is pleasant going (when dry) and passes a couple of seats carved out of tree stumps. Soon after the path briefly flirts with a forestry track, and then rejoins it a few minutes later. Follow the track uphill for ten minutes, until it turns sharply right, with our path going straight on traversing across the slopes of a small valley to the Col de la Saulce (1480 m), arrived at some 1½ hours after leaving the car. From here, the path traverses under the Lances de Malissard with fine views of Dent de Crolles and the cliffs overlooking the Perquelin valley. It reaches the Cabane de Bellefont (1639 m) after some 25 minutes. This newly-built unguarded refuge is located at the base of the Col de Bellefont pastures. In most years we have found the pastures being grazed, and the whole area has reeked of sheep urine, but in 2016 the sheep were absent and the whole pasture was a floral sea. With its nearby water source and after some two hours of walking, this is a convenient place for a second breakfast. The 300 m ascent up to the col follows gentle zigzags, and takes half an hour or so. At the top there are some fine views looking down into the Vallon de Marcieu, with the Dome de Bellefont on the right of the col, and our destination on the left. The route up is clear underfoot. It first scrambles up to a little path with a small pillar, and then ascends a steep rocky gully that requires the use of hands (Difficulty 2). This arrives at a col where it joins a route that ascends the west couloir on the other side. The path then traverses the ridge to reach some 40 m of steep scree for the final ascent. At the top of this, a fine path along the crest with magnificent views on all sides reaches the highest point all too soon about half an hour after leaving the col. Allow 3 to 3½ hours for the ascent from Perquelin. For the descent, return back to the Cabane de Bellefont, and follow the GR9 towards Dent de Crolles. It soon enters the Chaos de Bellefont, a well-named complex area of shafts, pits, and caves. 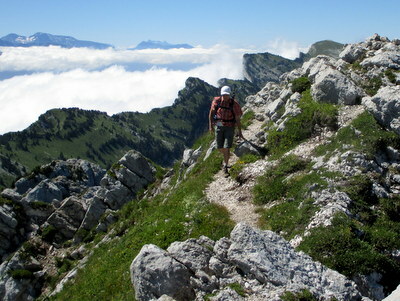 This is followed by an area of alpine meadow, le Prayet, which is the start of our route down into the Perquelin valley. When you find a sign-posted path towards the Pas de Rocheplan, look for a path going right towards the cirque going off by a well decorated tree - the Sentier du Colonel. Apart from a couple of short steep gullies, this is a superb descent path, which makes its way easily back down. After an hour's descent, you meet a forest track - go straight across. This descends rapidly, passing the Fontaine Noire - a captured water source which is the resurgence for the Chaos of Bellefont area, and before long you will find yourself emerging from the path we noted on the way up.